DULUTH, GA --(Marketwired - April 22, 2015) - Subaru of Gwinnett has become the official naming rights partner of the Business RadioX studio in Gwinnett. All radio shows that originate from the Gwinnett studio will now be airing from the "Subaru of Gwinnett Studio." 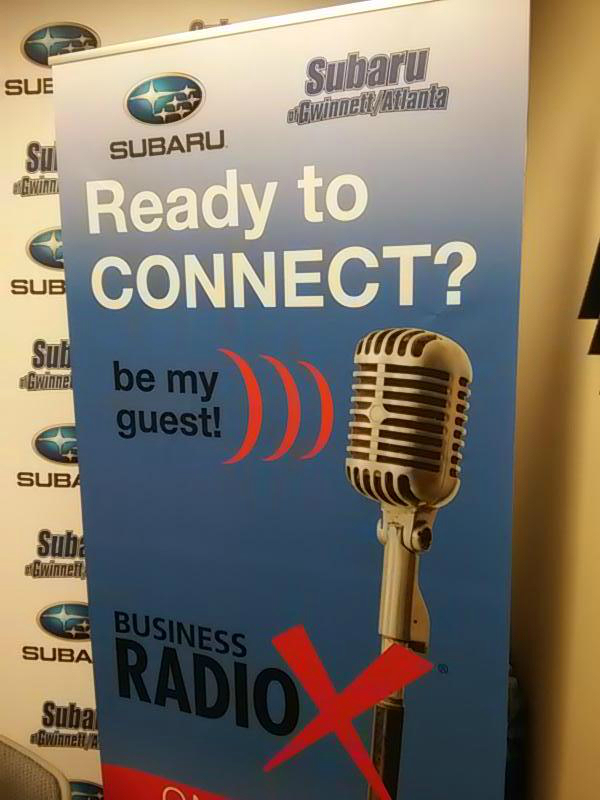 As part of this unique branding and digital media partnership, Subaru of Gwinnett also receives in-studio signage, live on-air mentions, website and social media recognition, on-site interviews and remote broadcasts, a monthly radio show on Business RadioX, and other branding opportunities. Executive General Manger Steve K. Kendrick commented, "Subaru of Gwinnett's media partnership with Business RadioX will hopefully show to not only the individuals but also the Business Community that Subaru of Gwinnett is a major automotive retailer by helping to deliver a professional product to Business RadioX, their clients and its community." "We are extremely excited about our comprehensive branding partnership with Subaru of Gwinnett," said studio owner/operator Mike Sammond. 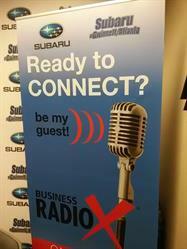 "The Business RadioX studio in Gwinnett and Subaru will be joined at the hip. This partnership allows us to reach even more business leaders and fulfill our pro-business mission to give a voice to the Gwinnett business community." To learn more about the Business RadioX studio in Gwinnett, visit Gwinnett Business Radio. To learn more about Subaru of Gwinnett, visit www.subaruofgwinnett.com. Business RadioX® interviews dozens of innovative entrepreneurs and successful leaders each week. Its mission is to help local businesses "Get the Word Out" about the important work they're doing for their market, their community, and their profession. With a pro-business slant and a long-form interview format, guests don't have to worry about being ambushed or talking in "sound bites." Guests have enough time to tell their whole story and to share their insights and experience without interruptions. Business RadioX® hosts are business professionals interviewing their peers, drilling down on the critical issues, and delivering practical information to an engaged business audience. Located in Duluth, GA, Subaru of Gwinnett offers a great selection of new and used Subaru cars. If you're searching for a new car, browse our inventory for the 2014-2015 Subaru Impreza, BRZ, Outback, WRX, STI, Tribeca, Forester and Legacy. If you would like to test drive any of these models, come down to 2920 Satellite Blvd. If, instead, you're looking for a used car in Duluth, we can help you there too. Browse our large selection of used Subaru cars as well as vehicles from other top manufacturers to find the right car for you. At Subaru of Gwinnett, we don't just sell cars, we provide a complete car buying experience. We provide our customers with everything from Subaru repair services, Subaru auto parts sales to car loan and lease financing. Come visit us today at 2920 Satellite Blvd and let show you how easy the car buying experience can be at Subaru of Gwinnett.